The leaders of Sri Lanka and Maldives today agreed to enhance cooperation in the fight against drugs and drug trafficking. The two leaders also discussed ways to further strengthen the long standing and historical ties between the two countries, details about existing bilateral agreements on trade, health, defense, education and maritime issues and possible new agreements that could be mutually beneficial, ,the President's Media Division said. Both leaders especially focused attention on enhancing bilateral trade opportunities. Two other areas which garnered attention were enhancing facilities granted to Sri Lankan’s engaged in business in Maldives and streamline Visa facilities offered to Maldivian students studying in Sri Lanka. 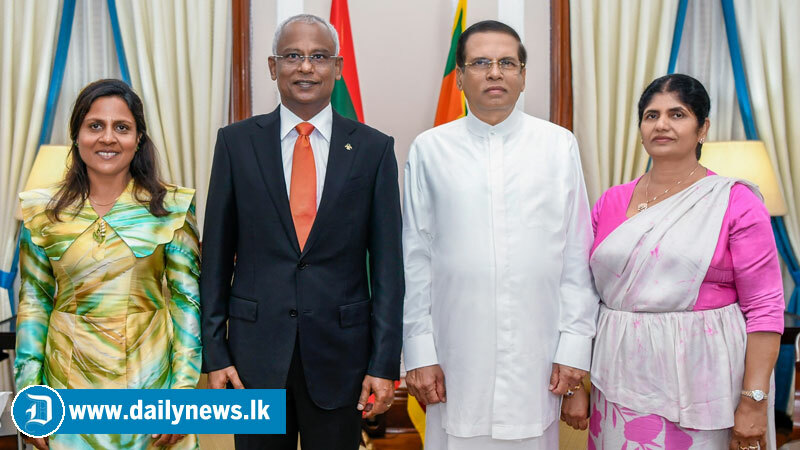 President Sirisena also thanked his Maldivian counterpart for participating as the guest of honour at the Sri Lanka’s independence day celebrations. The Maldivian President was warmly received by President Sirisena on his arrival at the Presidential Secretariat yesterday morning. A colourful ceremony had been organized including a guard of honour.